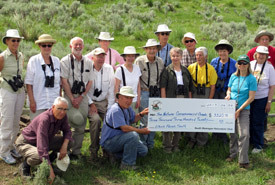 Four months ago The Nature Conservancy of Canada (NCC) announced their goal to raise $4.4 million to acquire the 1,836-acre (743-hectare) Elkink South Block southwest of Osoyoos. This acquisition will more than double the Sage and Sparrow Conservation Area, creating a world-class refuge for the many rare and endangered grasslands species that make their home here. The chance to conserve this landscape garnered a wide range of support, including eminent biologists, foundations, local businesses, naturalist clubs and dozens of individuals, as well as NCC’s government and foundation funding partners. With the funds now in place, NCC looks forward to announcing their successful purchase of the South Block in the coming months. Don’t move a mussel! Ritchie Lake Restoration – From Bad to Rad!